I’ve really enjoyed reading everyone’s blog posts this year. Adam took a placement at TRO in London. Early on Adam discusses having to rein in his creativity, and ideas, to suit a client when he was working to a brief. I had this problem initially too. I wanted to make everything look cinematic, which is not necessarily the right approach for every job. It took me a while to realise, I’m filming for the CLIENT not myself and I need to develop THEIR vision not my own. He also mentions regretting not pushing himself to get more video content at an event. This is something I have found difficult at times. Adam soon gained faith in his own professional opinion and by the next assignment was confident to tell the client exactly what he needed from them to get the shots he required. I have found confidence in my own professional opinion this year and it has been quite pivotal for me. It’s made me realise that I am no longer just studying to be a filmmaker/photogapher: I actually am one. Adam’s videos show the clear leap forward he has made with both his filming and editing skills this year. He has developed a real flair for After Effects, and this, alongside his newly gained confidence, will help him stand out when applying for work. Jeremie chose to take a sandwich year for very similar reasons to myself. We both wanted to gain practical experience, confirm the direction of our careers (by trialing them temporarily) and enhance our chances of getting work once we graduate. Jeremie discusses learning from his employer’s feedback, taking criticisms on board and working to correct them. This is something I have also found useful this year. As I’ve not always had an employer I’ve often asked other students from my course for critical feedback which has really helped me improve my work before presenting it to clients. It makes me realize how lucky I have been working in my hometown, with my friends and family close by. Part of the reason Jeremie eventually decided to cut short his time in Amsterdam was because he became homesick. But although things didn’t quite work out as initially planned Jeremy seems to have learnt so much from this year, describing it as ‘life-changing’. Sammy chose to go to Madrid as she is ‘interested in the music of different cultures’ and studying abroad would give her the opportunity to immerse herself in international music. Sammy has grown in many similar ways to myself, Adam and Jeremie. But we were both surprised by problems employers/organisations had that had a knock on effect upon ourselves and our work. It’s easy to imagine that ‘real’ professionals never make mistakes, but no matter how ‘professional’ anyone is they are still human. We all work in the confines of the real world, which can throw many challenges at us. Eye-opening as this was we have both learnt to stay calm under pressure and have developed strategies for dealing with problems should they arise. I have been in contact with Sammy and would love to collaborate with her in the future as we are both eager to develop community street art projects inspired by our travels this year. As my Professional Enhancement year comes to an end I realise how happy I am that I opted to take this additional year and even more happy that I chose to freelance for it. But I have to admit I was rather hesitant when I first looked into things. There is very little student finance available during a sandwich year and this meant I would have to guarantee regular work, something hard to do in the freelance world, or else I wouldn’t be able to cover my rent and bills. I did a lot of research before I made my final decision, making a business plan, meeting with former clients to let them know of my new availability and, where possible, scheduling a calendar of future work. I consulted with the university’s Social Enterprise team and took advice from tutors. I also made up a list of helpful local contacts and wasn’t shy about promoting my new venture on social media so everyone was aware that I was available for work. Once I had decided to take the leap I had a lot of paperwork to sort out. I needed to register my business, arrange public liability insurance, set up an accounting system, design invoices and health and safety assessment forms as well as complete an assessment for the University so they could confirm I would always be considering the welfare of my clients both physically and ethically. Luckily this was something I had researched quite extensively the previous term for a documentary I’d been working on. Over the summer I worked for NCS, leading media workshops which young adults, and I volunteered at the Flatpack Film Festival, Swingamajig Festival and BE Festival, helping with their production design. I really enjoy production design and threw myself into helping the team design and paint backdrops and gather together a wealth of props. Both summer jobs would lead, in a round about way, to future paid work and a new contact from NCS actually hired me for my first freelancing job at the start of October. Olivia had been running drama workshops at NCS and we’d got on really well working together. Before I left she took my details and asked if I might be interested in photographing at some events she was organising later in the year. The first one was a children’s fancy dress Cinderella Ball event. The event was great fun but the lighting was terrible, as the lighting technician dropped out at the last minute, which meant I had additional hours of editing in order to rescue my images. But it taught me a short, sharp lesson about budgeting sufficient editing time into future quotes and about bringing additional equipment, just incase of emergencies. Part of my freelancing plan was to do paid work balanced by a percentage of voluntary work each week. Starting with more voluntary work at the beginning of the year, as my business was gradually developing, with a little less voluntary as paid work hopefully increased. I joined a community group called ‘Local People, Spon End’ led by the charity Sustrans, with the aim to improve areas within Spon End, including cleaning up parts of the River Sherbourne and improving the subway that leads from Spon End into Spon Street. Subways (underpasses) are a huge love of mine, along with Coventry’s ring road, and I was keen to get involved with something that would help me give back to my local community. Over this year we have trialled new lighting ideas, secured links with IKEA to provide new seating outside the subway, held workshops to gather local people’s ideas and even taken a trip to Bristol to research the positive benefits of local street art and the rejuvenation of the city’s Bear Pit area. At the end of October I would work for Olivia again, this time photographing a Halloween Villain’s Ball and my calendar began to fill up as Christmas events were being booked. My next main project was with the Albany Theatre. I was hired to make them a trailer for their new production of Wind in the Willows along with some promotional photography for social media. I really loved working on this production. The cast were so friendly and the set and costumes were a delight to film. My main problem was the time frame I had to work within. Due to tight rehearsal schedules I could only film during school matinee performances which left me filming from the back row, over children’s bobbing heads, which was far from ideal. I somehow managed to make it work and arranged to grab a few cast members after performances to do a couple of close up shots before they had to leave, but if I was to work on a similar production again I would insist on having access to dress rehearsals. I think my lack of faith in my own professional opinion at the time stopped me from doing this, but over the year this has finally developed and will, hopefully, ensure I assert myself in the future. During the year I have also tried to attend as many events and exhibitions as possible, to practice my photography, and when I had any strong images I was careful to tag them well so they would be seen by the event organizers and artists involved. This has led to several artists contacting me to use my photos on their websites. 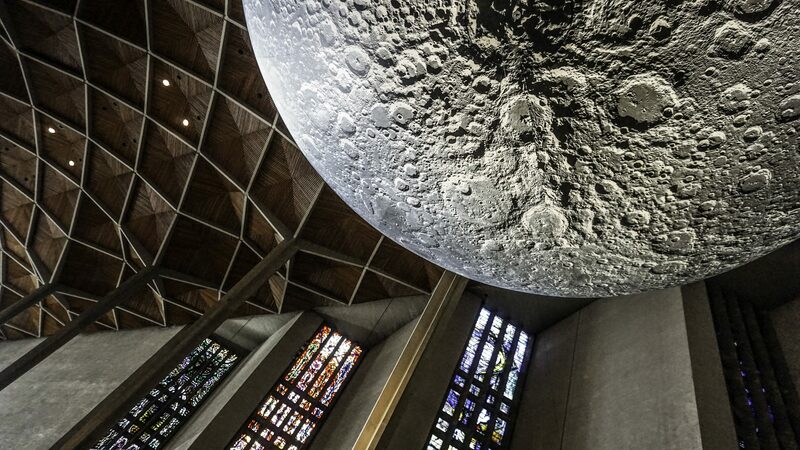 Including Luke Jerram’s Museum of the Moon, Benedetto Buffalino and Benoit Deseille’s FishTank at Lumiere London and Chris Judge’s Braeve Maeve Murals in Bray, Ireland. I’ve found tagging my work correctly can lead to unexpected opportunities. Last month I was invited to appear on BBC CWR Radio’s Culture Club show, to talk about local events, after the producer found some of my images on Twitter! Contacting previous employers to let them know of my availability led to work after Christmas with Fresh@CU, the DMLL office and the University’s Health and Safety Department. In January I started working on a psychological horror film called Embers. I was initially taken on as Production Designer but also ended up being a Script Advisor, Location Scout and Costume Designer. I found a location for us to shoot at in Northampton and soon set about planning exactly how I wanted the set and costumes to work together. The film took 4 full days to shoot and meant 9am starts and midnight finishes, with a long drive from Coventry and back every day, but it was well worth it. I’m really pleased with the look of the final film and couldn’t have worked with a nicer team of people, who I learnt so much from. As the film is currently entered in several film festivals I cant share it with you here, so have included some stills from the film instead. As February came round I was introduced to Enjoy Coventry. A local website set up by the University’s Student Union to shout about everything there is to Enjoy in Coventry. Having grown up in Coventry I know there is a lot going here, if you know the right places to look, and I was really keen to join the team. Coventry has so much going for it and now is a really exciting time for the city’s development, having just won the bid to be UK City of Culture 2021. Over the past few months I have been running the site’s social media and photographing and reviewing local events for them which I have found great fun. At the end of the month I got a message from a friend I met at BE Festival last year. She was now working at the The Belgrade Theatre, looking after their PR & Marketing, and their usual photographer was unavailable for a shoot they had set up at Kenilworth Castle and she wondered if I could step in and cover the assignment. Of course I said yes and I’m so pleased I did. By the next day the photos were out in a press release and all over social media with my name attached to them. It was great feeling to see my images being so well received and used in so many local publications. I have presented just a highlight of my working year for you here, but if you’d like to find out about some of the other projects and events I’ve worked on, you can see some of my favourite images in the slideshow below and read my full weekly blog here . As well as doing paid and voluntary work this year I have also tried to involve myself with more artist groups in the city and now attend a regular monthly drop in at Coventry Artspace, where you can discuss projects with other local artists, create new partnerships and gain helpful advice. Through Artspace I have found out about several arts funds I can apply for and am currently waiting to hear back from New Art West Midlands about a bursary I have applied for to do some research into DublinCanvas, a community street art project in Dublin that i would love to see replicated on the street of Coventry. Before meeting with Artspace I had no idea how much funding and training was available to local artists and this has made me decide to take the ArtsFunding add+vantage module next year so I can investigate these opportunities further. This year has given me the opportunity to ‘try out’ working for myself and it has made me realize that this is 100% what I want to do once I graduate from university. Trying out so many things has also helped me decide exactly what direction I want to steer my career in. I now know that I want to work on flamboyant events, photographing and filming festivals, gigs, re-enactments, burlesque performances, circus acts, cosplay events and theatre. Anything bright and vibrant where I can express my creativity through my camera. No more corporate events, filming conferences or speeches. Where you have to set up, point and shoot. I know there is a lot of money to be made filming things like this, but it’s just not for me. Having the freedom to shoot a little differently and have control over my creativity gives me the balance I need between work and art. Something I didn’t realize was a priority for me at the end of last year. I’ve also been able to identify my strengths and weaknesses. So now I can address them as I move forward with my career. My work with Enjoy Coventry has made me realise my familiarity with social media is a real strength. In two months I helped expand their social media to a 30k weekly reach and I think social media and marketing will be my USP from now on. Not only can I photograph and make video content for an event/organisation but I can also help them promote it in the right way, so it gets as much social engagement as possible, and brings in and, more importantly, holds an audience’s attention. My weakness is definitely trying to take too much on. But I think part of the solution to this problem will also help address another problem I had last year – I really missed working with other people! Working on your own can be a little lonely sometimes, especially after university group work where I was always teamed with large numbers of people. In first and second year we all moaned about how annoying group work was but this year I often found myself wishing I had another crew member with me, for their opinion on a shot or just to be excited about something interesting being captured on film. In the future I plan to work on more collaborative projects. Not all the time but maybe for half of it. Working with others will help to spread my workload and I also think it will help with my creativity as I always seem to have the best ideas when working with others. But one of the things that helped me feel less lonely this year was being able to share my experience with other students through the MPA Enhancement Year Google+ community page and Facebook group the University had set up for us online. I was able to read other student’s regular blog entries and it was really helpful to compare and contrast their experiences to my own. Thoughts shared were very personal and not only informed me about their recent work opportunities but also gave me an insight into how they were feeling. I was encouraged by their resolve in the face of adversity, cheered by their achievements and began looking forward to checking my WordPress map to see what countries my blog was now being viewed from. I was also lucky that another student from my year, Atanas, was freelancing in Coventry as well, and we tried to meet up at least every few months to compare experiences in person. The second part of addressing my problem of taking on too much work is finally learning to say NO. This year I’ve realised that I need to accept that saying no is not being seen as unreliable. Having other commitments is okay, in fact it’s just a part of balancing your home and work life. I’ve learnt that it’s good to take opportunities when you can but, realistically, you can’t take all of them. You need to be selective and prioritise. Decide which opportunities warrant the biggest pay off – and I don’t mean financially! Sometimes taking a voluntary job where you have the opportunity to learn a new skill will be far more beneficial in the long term than a day’s paid work doing something you already know how to do. Taking on too much because I don’t want to let people down or miss out on things will eventually lead to me letting people down because one person can only stretch so far. I’ve learnt that scheduling days off, putting aside time to be creative and having time with my family and friends also need to be priorities. The experiences I’ve had and the lessons I’ve learnt this year are invaluable, but I have also been lucky enough to put aside a little money from the assignments I’ve had and I’ve used that money to invest back into my business to help it grow. I have been able to buy equipment gradually, one or two items each month, and now I have enough kit to be able to work for myself as soon as I graduate. I probably would have needed to spend at least six months to a year working for someone else to raise money for this equipment, but I no longer need to do that. I now have my own camera, two new lenses, a Manfrotto lightweight tripod, nd filters, spare batteries, a monitor, a projector, professional audio headphones and lighting. To complete the kit I just need my own audio equipment, but as I now have a group of clients who return to me with regular work and a possible part time job offer lined up for next year, I am confident I can make the money to buy both a Zoom H6 recorder and a couple of Sennheiser mics within the next six months. Doing a percentage of voluntary work was alway part of my plan for this year and I’ve found community work is something I want to continue with particularly as my business grows. It’s made me realize how a small amount of my time can make a real difference within a community and it’s certainly not one sided. I’ve met so many wonderful people through community and voluntary work who are now friends. And it’s helped me build strong local contacts and even led to paid work opportunities. So it’s definitely a two way street. I’d really recommend a sandwich year to anybody studying at university. Whether it’s opting to study abroad or take a placement within the uk or work for yourself. As well as all the benefits I’ve already mention it’s given me a new confidence that I was lacking before. A confidence in myself and in my professional ability that I think will really help me when I return to university in October to complete my final year.